At least 20 people have been killed by a bomb blast that struck a busy market on the outskirts of Pakistan’s capital, Islamabad, police and medics say. The high intensity blast at the fruit and vegetable market left as many as 100 injured, reports say. The Pakistani Taliban has denied involvement. No other group has said it carried out the attack. There is currently a ceasefire between the Pakistani Taliban and the government as part of peace efforts. Pakistan’s PM Nawaz Sharif condemned Wednesday’s bombing. He said it was an effort by Pakistan’s enemies to destabilize the country, but that the government would remain resolute in its efforts for peace, according to his office. The latest reports from hospitals in the area say as many as 100 people were injured. An AFP reporter at the scene said the blast caused a 5ft-wide crater in the ground, which was littered with body parts. 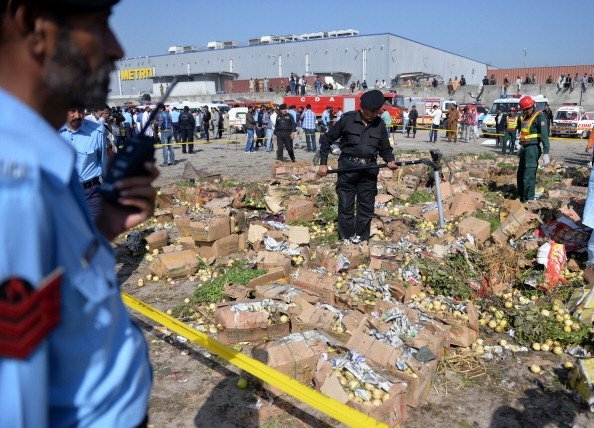 The bombing reportedly happened in the Sabzi Mandi area of the capital about 08:00 local time, one of the busiest times of day for the wholesale fruit and vegetable market. Police said the explosives were hidden in a box of fruit. In a statement, the Pakistani Taliban (TTP) said it strongly condemned the attack. “The killing of innocent people in attacks on public places is regrettable and prohibited by Islam,” it said. Correspondents say the TTP sits at the helm of a loose network of territorially independent militant groups who have different agendas. Not all of them will favor peace talks. The blast comes a day after 13 people were killed in a bomb attack by separatists in Balochistan province. The long-running insurgency in Balochistan is separate to the Taliban campaign which has raged inside Pakistan since 2008.